The Waste Management Phoenix Open is the best-attended golf tournament in the world every year. Typically, about half a million spectators attend this event. Dating back to 1932, the Phoenix Open has raised more than $111 million for charities in Arizona. Because of the layout of the course and the parking, this event never sells out. Everyone who wants to attend can go. Why is it so popular? Could it be because of the location in beautiful Scottsdale, Arizona? Could it be because the weather is usually wonderful and sunny? Could it be because the best golfers in the world come to play in this prestigious event? The answers are yes, yes, and yes. Here is the schedule of events for the entire tournament. Will the Tournament be Televised? Yes. The first two rounds (Thursday and Friday) are usually televised live in Phoenix on The Golf Channel in the afternoon, then rounds three and four (Saturday and Sunday) are televised on The Golf Channel in the morning and on CBS in the afternoon. The entire course will be a giant hot spot with free wi-fi. This event never sells out. Yes, there's an app for that. You can download the Waste Management Phoenix Open app to get hole-by-hole descriptions, maps and scoring updates. There is also a separate app for the Coors Light Birds Nest. Waste Management will continue the "Zero Waste Challenge" with 6,000 recycling and compost bins and three 40-yard dumpsters transformed to become staffed, interactive Zero Waste Stations. New security procedures for all PGA events began in 2014. Opaque (not see-through) bags are not to exceed 6"x 6"x 6". Clear tote bags, plastic, vinyl, or other carry items are not to exceed 12"x 6"x 12". Approved clear plastic bags will be provided at the entrance and at shuttle drop-off points. No backpacks, no purses, no binocular cases. On Saturday, everyone is invited to participate in the annual GREEN OUT. Players, caddies and fans are encouraged to wear green to showcase their support for the environment and the community. For every person who wears green on Saturday a donation will be made to three non-profit organizations with a sustainability focus. TPC Scottsdale is a public facility owned by the City of Scottsdale and is comprised of two 18-hole par-71 championship courses designed by Tom Weiskopf and Jay Morrish. The Desert Course at TPC Scottsdale was redesigned in 2007 and renamed Champions Course. The Phoenix Open has played on the Stadium Course since 1987, which was designed for this PGA tour event. Every year the Stadium Course at TPC Scottsdale is ranked as one of the best courses in the State of Arizona and in the country. Both are set in the beautiful environment of the Sonoran desert, with the McDowell Mountains in the background. Typical of a desert course, there are cacti and mesquite trees. An extensive renovation of TPC Scottsdale's Stadium golf course and clubhouse was completed in 2014. One of the most interesting holes on the Stadium Course is number 15. It is 552 yards from the championship tees. Water all along the left and bunkers all along the right lead you to an island green. Another memorable hole is number 16. It's that infamous par three. Were you there the day that Tiger Woods hit his hole-in-one on that hole? I was! You can see a scorecard and a layout of each of the holes, compliments of The Tournament Players Club. If you are visiting from out-of-town, here are some recommendations for nearby hotels. Check here if you'd rather try to find a vacation rental. The Phoenix Open is never sold out and tickets will be available at the TPC gate during tournament week. They can be purchased at the event, or in advance through Ticketmaster.com. There are also ticket packages that are a good value for people who will be attending several days of the event. Here is detailed ticket information. Ages 17 and under are admitted free when accompanied by an adult. Military and Arizona first responders (along with one guest) are admitted free with official ID. Register here for the free admissions. Looking for seats on the infamous 16th hole? Here are those details. TPC is in North Scottsdale, right next to the Fairmont Scottsdale Resort. Here are directions and a map. This location is NOT on the Valley Metro Light Rail route. You'll need to drive or hire a driver. Leave plenty of time. The Arizona Department of Transportation usually provides detailed motorist information, including any travel or road restrictions. Call 5-1-1, then *7. The call is free. If you do not have a reserved parking pass, you can assume that you'll be parking in an off-premises lot and taking a shuttle to the event. The parking is free and so are the shuttles. The shuttles run frequently. There will be thousands of cars there, so don't forget where you parked and which bus you need to take to get back to your car! The parking, shuttle and entry process can add 30 minutes or more to your travel time, so if you are trying to get to a certain tee box to see your favorite player tee off at a particular time, take that into account. Free public parking is available at Loop 101 and Hayden Road. Free public parking is also available Wednesday through Saturday at WestWorld located at 94th Street and Bell Road. Handicap parking is located directly across from the Main Tournament Entrance. Here is a map of the general lots and the lots for pass holders. There are restrictions on what you can bring into the TPC Scottsdale, so check the rules before you cram your backpack full of stuff. These security policies are in effect for all PGA events. Aside from the obvious, and bags larger than 6”x 6”x 6” must be transparent/clear. You can bring folding or camp chairs, but not the bags. In 2012 the restriction on mobile devices such as cell phones was lifted. They must be set to silent mode at all times. There will be designated areas where people can use their phones. In 2018 the restriction on using phone cameras was lifted. Please silence the camera click sound. If you expect a sunny day bring water, a hat, sunglasses and sunscreen. A temperature of 70 degrees sounds perfect, but it can get very warm in the sun. Dress comfortably and wear walking shoes -- you won't always be walking on concrete paths. If you are the type of spectator that likes to find a great spot on a particular hole and stay there all day to see all the golfers pass by, bring a blanket or low chairs (leave the chair bags in the car) and lounge away! 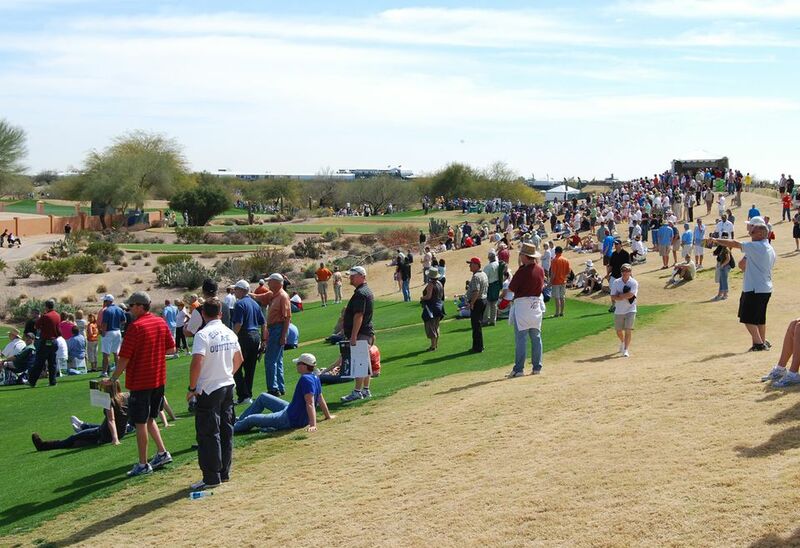 Each year at the Waste Management Phoenix Open you'll witness record crowds of people enjoying sunshine, Scottsdale, and watching the professional golfers playing in the Waste Management Phoenix Open. When the day's golfing activities dwindle, and you're looking for a place to mingle, the Birds Nest is the place to go. The Birds Nest features Valley bands, food, and drinks. It's the golf party of the year! Hours: 3:30 p.m. to 10:30 p.m., Wednesday through Saturday, with main stage entertainment beginning at about 6:30 p.m. It closes at 10:30 p.m. Parking shuttles will operate until 11 p.m. on the nights that the Birds Nest is open. General admission tickets are available in advance through Ticketmaster.com. They may also be purchased the at the Birds Nest ticket office and Birds Nest ticket sales booths located throughout the Waste Management Phoenix Open. Tickets sold on the day of the show may be priced higher and are subject to availability. You must be at least 21 years old to get in. Ticketmaster.com may offer resale tickets (at a higher price) through their ticket exchange, Tickets.now.com. You may be able to buy tickets from scalpers/ticket exchanges. Note: beware of fake tickets! Visit the Birds Nest official website. All event information, prices and times subject to change without notice. What Is the Most Exciting Hole on the PGA Tour?